Catie's Crystal Healing Question - Help! I was recently emailed by Catie (not her real name) about an issue that came up for her while attempting to work with crystals for the very first time. My reply to her dilemma is posted below. This is going to sound really strange. Here goes! When I was in my early 20's, crystals became very popular. I found the whole thing really interesting, though I knew little about them. A friend of mine, who also didn't know much about them, bought me 3 really pretty ones along with a book about them. 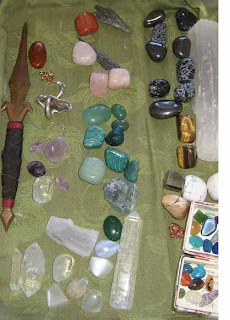 The book said that in order to get the most benefit from the stones you had to put your energy into the stone and something about clearing it (can't remember it was so long ago.) Anyway, it said to hold the crystal in your left hand, look into your own eyes in a mirror and clear your mind. I was pretty skeptical, but thought "what the hell." So I did it, and while I was staring at my own face in the mirror, suddenly my face was replaced by the face of what I can only describe as an evil looking creature and it literally growled at me. Needless to say it scared the hell out of me. I ran out of the room and threw everything into the trash and tried to convince myself that it was my imagination but even after all of these years I KNOW that it was very real. It really freaked me out and I have always wondered what the hell that was all about. Any idea? Thanks for listening to my crazy story. To better understand Catie's dilemma I decided to meditate and read the situation psychically. It was very clear, right away that the answer was simple. Catie was actually seeing her own fears looking right back at her. I also sensed that she may have been sacrificed in a past life and I felt some pain in my wrists. Because of that experience(s) Catie may have a fear of exposing herself in her present life to those who will judge her harshly. For Catie: Always know that you work with the light and the dark in balance. 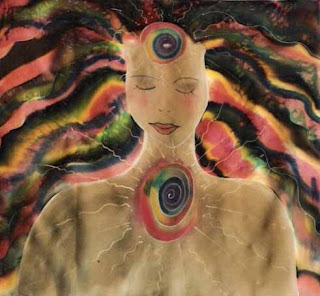 Know also that you are grounded in Mother Earth ('clay feet' - see a previous post) and that your soul shines. Feel yourself protected by envisioning a crystalline glow surrounding your body; shimmering, clear and rainbow hued. I am queen of my own domain. Finish up by thanking your guides, god/dess, the Divine, etc. for allowing you this moment of grace and understanding. The silk painting pictured above is my depiction of how my first ever acupuncture treatment made me feel. If any of my readers have any other questions or concerns about crystal healing please don't hesitate to comment below.